"This system is easy to use and really provides dramatic results. Anyone can draw in 3-D with this fantastic system. The drawn images stand up erect off the page!" David Kuntz, Former Editor "Stereoscopy", International Stereoscopic Union You can learn to draw in 3-D! "Phantogram Perspective Charts" The only book that teaches the art of drawing or printing anaglyph (red & blue/green) images. 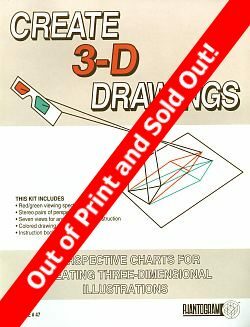 This book is geared towards making 3-D geometric drawings, but the principles can be applied to all anaglyph work. The set consists of a 10'' x 13'' 44-page book, seven drawing charts with right and left eye Perspective grids, 2 pairs of 3-D glasses, and anaglyph color pencils. Using the grids and the techniques shown in the book you can easily create your own 3-D anaglyph drawings. Numerous illustrations are used, including many impressive anaglyph 3-D examples. There is also a Color Reference section giving exact printer's inks, color adhesive films, aniline dyes, and paint colors for anaglyph use - and more. A new addendum shows alternate viewing methods, including converting drawings to Stereo Realist type slides and side-by-side stereo prints. Now YOU can learn to do 3-D artwork! The most valuable reference for anyone interested in 3-D drawing. Out of Print and Sold Out!